Falun Gong practitioners say the “public expression” bylaw just passed by Vancouver City Council makes their protest vigil outside the Chinese consulate impossible and leaves the group no choice but to go back to court. Councillors voted 6-4 to approve the revised bylaw covering protest structures after a marathon meeting on Tuesday that went until midnight. “There is no other choice, we have to go back to the court to let the court judge the bylaw,” said Sue Zhang of the Vancouver Falun Dafa Association. 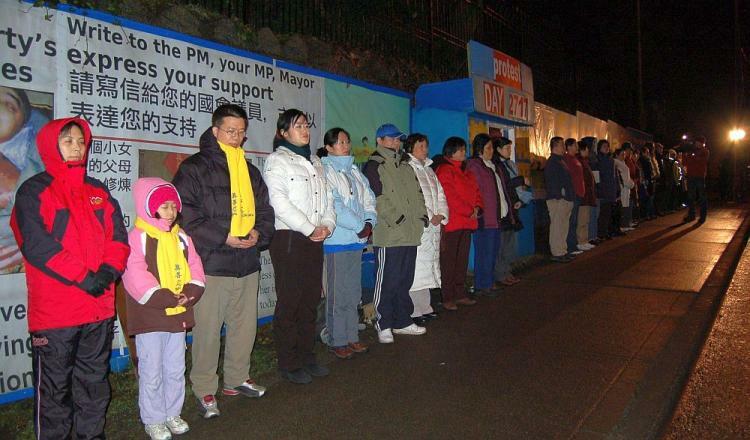 Falun Gong maintained a 24-hour protest vigil outside the consulate in Vancouver 365 days a year to protest torture and persecution in China. Though the city found the protest was not a disturbance, it was an embarrassment to the Chinese consulate, which pressured the city to have it removed. The vigil depended on a small hut to shelter protesters, many of whom were elderly Chinese women, from the rain, snow and nightly chill. 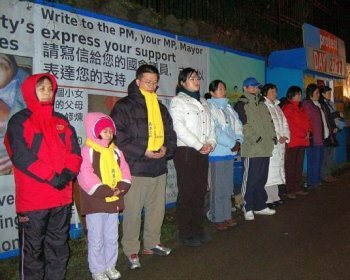 Falun Gong practitioners have said they are willing to submit to rules that would ensure the safety of passersby and a reasonable size of hut, but that requiring them to remove the hut every day between 8 p.m. And 8 a.m., and for a month at a time—as the new bylaw now does—would essentially end their vigil. They argue the bylaw also runs counter to a ruling by the BC Court of Appeal telling the city to draft a bylaw that did not restrict Falun Gong practitioners’ right to expression. The court ordered the city to redraft the original bylaw saying that its previous restrictions were unconstitutional, and found that the group’s protest structures outside the Chinese consulate were fundamental to their freedom of expression. Zhang said despite widespread criticism of the bylaw, it appeared city councillors had already made their decision to approve it before the public hearing had started on Tuesday. Councillors stayed late in order to meet a court ordered deadline to come up with a new bylaw by April 19 and to hear public comments on the revisions. COPE councillor David Cadman, who was strongly opposed to passing the bylaw, said if the city goes back to court he “guarantees” they will lose again. He criticized city staff for consulting the Chinese Consulate in the making of the bylaw, before giving it to council at the final hour, with less than 2 weeks to review it. “I don’t think this is going to pass. … And it’s more money down the drain as we try and fight a charter provision, which is national and pervasive, through a street bylaw. It simply is not going to stand the test at court,” he warned council members. Many at Tuesday’s meeting spoke against the bylaw, whose requirements include removing any protest structures between 8 p.m. and 8 a.m., removing structures every 30 days, and fines of $1000-$5000 for violations. Mayor Gregor Robertson emphasized the precedent the new bylaw set in permitting protest structures, saying it is a first in Canada. But legal representation for the Falun Gong, Clive Ansley, argues that the city is trying to frame the bylaw as a precedent for free expression while hiding the fact that it removes many previous freedoms for protestors. An outcry erupted recently when the city revealed it had consulted the Chinese authorities as a “stakeholder” in the draft bylaw, which banned protest structures in front of the consulate. Under scrutiny, the city made revisions to the bylaw to allow such structures, but the restrictions would still put an end to the Falun Gong vigil, says the group. Ansley said the refusal of the city to honour the court’s decision, which he sees as an attempt to satisfy the Chinese consulate, means the issue will again end up in court. “Passage of this draft will guarantee another lawsuit and further squandering of taxpayer money on a cause which benefits only the Chinese Communist Party and the Consulate-General which represents the Chinese Communist Party in Canada. Although well disguised and designed to obscure the real effect of the new bylaw, this draft effectively amounts to a prohibition of the Falun Gong vigil,” he said. Robertson said, however, that the city has found a “balance” and complied with the Court of Appeal’s instructions to regulate protest structures. “Collectively we’ve done a very reasonable job of moving this forward,” he said. The BC Civil Liberties Association also opposes the new bylaw, saying it violates rights and is unconstitutional. The organization said it will be “bringing or joining” a court case against the city in response to the bylaw’s approval. “This situation smacks of the hasty passage of the controversial Olympics anti-free speech bylaws. Citizens should not have to file lawsuits in order to get the City of Vancouver to properly consider the constitutionality of its bylaws,” BCCLA president Rob Holmes said in a statement. The stained-glass windows in Orleans Cathedral, like those in many European cathedrals, told a story. It was surprisingly familiar, if unusual.